The actual configuration of the vehicle (in the 1970's, Western aerospace analysts using open source information assumed the Proton first stage consisted of a core vehicle with six strap-on booster stages, analogous to the R-7 / Vostok vehicle. 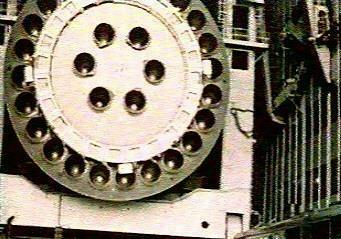 In fact it was a single stage built of modular components, like the American Saturn S-IB). Comment: In the same week this American report was issued, the Soviet government approved an integrated L1/L3 project plans indicating the first N1 launch in March 1968. A moon landing would not come until the third quarter of 1969 at the earliest. 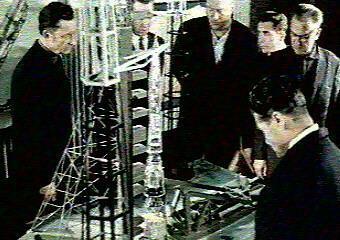 Therefore the CIA estimates fully reflected current Soviet plans. 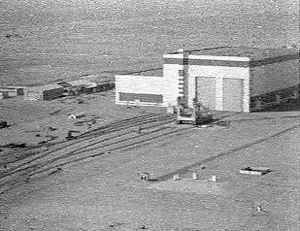 Construction of the N1 launch complex began in September 1963 and was detected by the CIA almost immediately (3 � years prior to the report). Again detailed knowledge of Soviet program decrees is offset by mis-estimates in the technical areas. 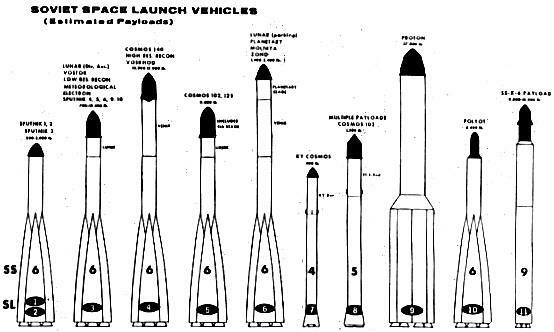 The use of Proton rocket stages from Chelomei's rival design bureau was never considered by Korolev (Chelomei had his own moon rocket design, the UR-700, that did use the Proton stages in the manner described by the CIA). The actual thrust of the N1 was 9.7 million pounds, and the payload into low earth orbit was to be 210,000 pounds, at the bottom of the range estimated. Comment: The circumlunar program was indeed authorised in August 1964. The comment about planetary manned exploration is interesting - the Soyuz capsule would have been the re-entry vehicle for the various Mars expedition schemes of the mid-1960's. The MEK concept of 1970 even had a Proton-launched circumlunar version of Soyuz being used to transport the crew to the Mars spacecraft after it had cleared the radiation belts on its slow acceleration spiral from low earth orbit. Comment: These were indeed the Soviet's expectations. In February 1967 they planned to conduct one Soyuz 7K-L1 mission a month, leading to a manned circumlunar flight as early as June 1967. There did indeed seem to be enough margin to beat the Americans around the moon before the 50th anniversary of the October revolution. Although the first test launch in March was successful, this was followed by the Soyuz 1 disaster and a string of failures in testing the L1 design. 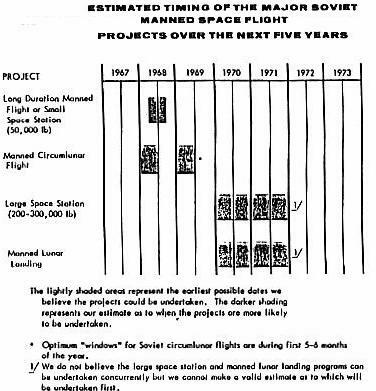 By June the project was reorganised and monthly launches leading to a manned circumlunar light in November were planned. Five days later NASA decided to send Apollo 8 around the moon in December. 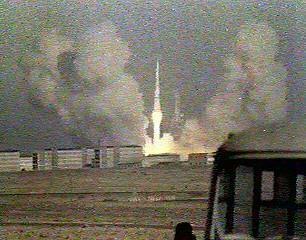 Further problems with the Proton booster and Soyuz spacecraft led to the Americans being first around the moon. Comment: This CIA analysis of trajectories is not echoed in Soviet plans. It is not clear if the CIA is referring to the possibility of �free return' trajectories or additional propulsion requirements. 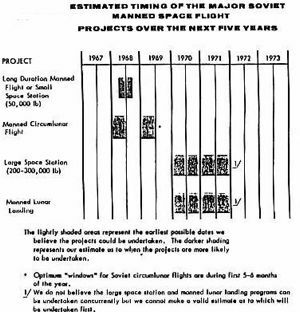 In any case the Soviets planned manned circumlunar flights for anywhere from June 1967 to November 1968. CIA Assessment of Soviet lunar and space station plans in February 1967.